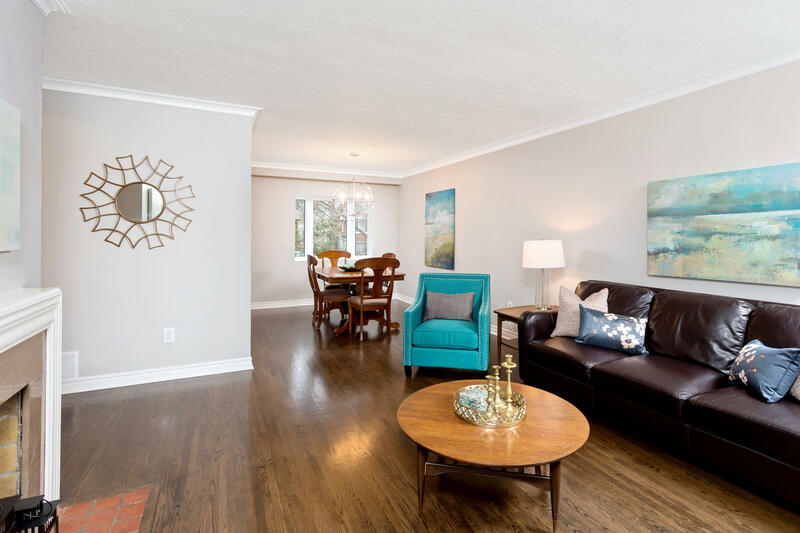 When we took the challenge of preparing this Mid Century Raised Bungalow for sale the mission was clear: Update the 50 year old home that had good bones but at the same time was in need of a pre sale update. 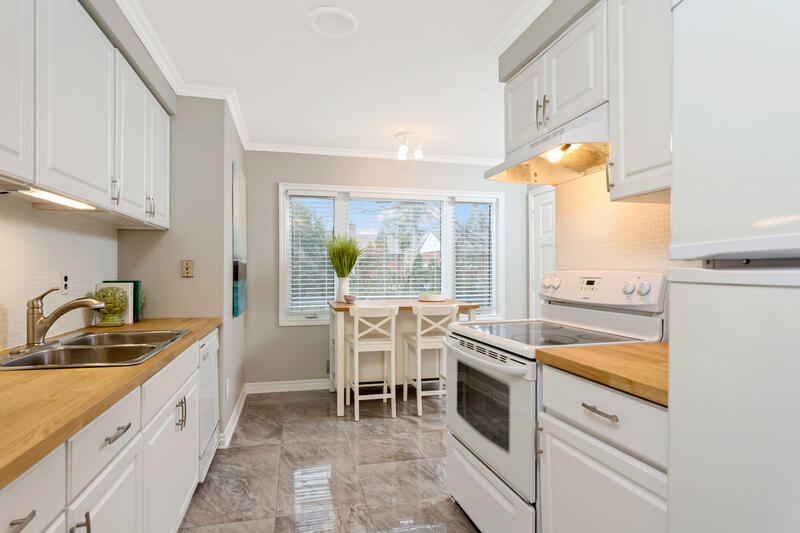 This home was located in a high demand area so it was important to maximize the lifestyle appeal of a turn key, bright and open concept home. These are all concerns that many homeowners have and I completely understand. That’s why we have a documented approach and a system for preparing homes for sale, so we can go step by step to maximize the selling price and experience. Depending on the home, the amount of work and the prep time needed to get the highest price possible can vary from a few days to several months before we list. If you have any niggling feelings that you home might need work before you list it for sale, it’s in your advantage to meet with us early on so that we can determine the scope of work and timeline that is reasonable and achievable for you. Whether it will take one week or two months, we’re working with our clients from day one. The first step was to book Stephanie (owner of her own design & décor com- pany, Style by Stephanie) to do the initial staging consultation. In this case, both Stephanie and our clients felt that making some cosmetic updates would improve the appeal of the home. We set an appropriate budget based on market research so that our sellers were confident they would recoup their investment in the sale price, focusing on the items that would provide the greatest impact and return on investment. Within this budget, we were able to refurbish the wood floors, add tile to the front entry, kitchen and bathroom, paint all the trim and walls on the main floor, and update the light fixtures. As is the case with many owners who live in a home for a long time, they also had a lot of furniture and other things collected over the years so Stephanie went through everything to try and work with as much of the home owners items as possible. The first step was to re-finish the hard wood floors as they were looking worn and dated. 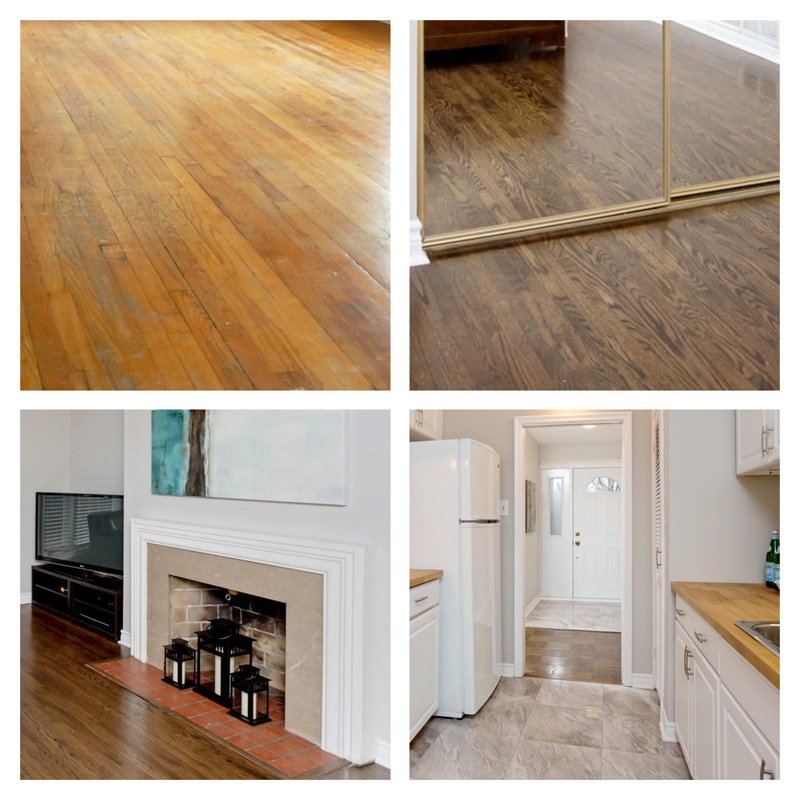 The home owners were going to refinish the floors in their natural colour, but Stephanie suggested they choose a darker walnut shade for two reasons. First, it would ensure any remaining stains were covered over in case the contractor couldn’t sand them all out and second, the darker shade is a more contemporary and popular colour choice. We also had the floors in the kitchen and front foyer tiled, which involved removing all of the lower base cabinets in the kitchen to install the floors properly. If the kitchen had stone counters, we would not have done this work, for risk of disrupting and breaking the counters. But since they were butcher block, we knew improving the floors from vinyl added significant value and appeal. We don’t recommend doing anything if it cannot be done properly, and we always work with excellent trades people who take pride in their work. The original fireplace surround was dated, and some of the tiles were broken. Given that the fireplace was an important feature and focal point for the room, it was important that it looked in good condition. The home owner was nervous about replacing the floor tile for fear of damaging the wood floors around it. So we focused on the damaged area and covered the fireplace surround with neutral granite slabs. Olympia Tile really helps to ensure we found the best looking options that didn’t risk complications during the installation. We staged the fireplace with an eye-catching piece of art to ensure the buyers focused on the positive features of the room. The next step was to modernize the main bathroom, and we did this by choosing a light coloured marble mosaic floor tile for the bathroom. Stephanie went with our clients to Olympia Tile (a fantastic showroom) to help pick out the tile for the house, all of which was a very reasonable price when working with a contractor. She also has many haunts where she finds high end product at reasonable prices. This is all part of the concierge service we offer for anyone who is listing their home for sale. 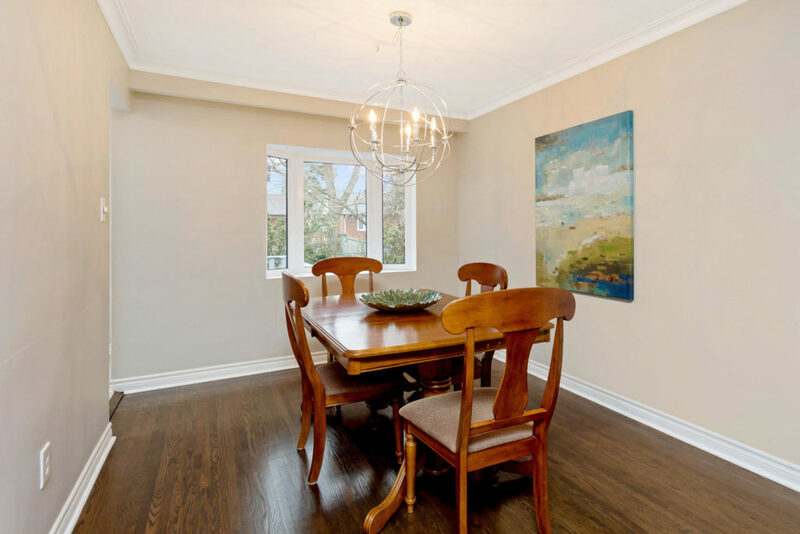 When preparing a home for sale, a neutral paint colour on the walls is key. Neutral doesn’t have to mean brown, Stephanie often uses muted shades of grey, blue and green to create a calm yet interesting backdrop to the room. “For this home, the view out the large windows and the refinished floors were the big selling points, so I wanted to use a warm grey (Benjamin Moore Edgecomb Grey) to let these features take centre stage. 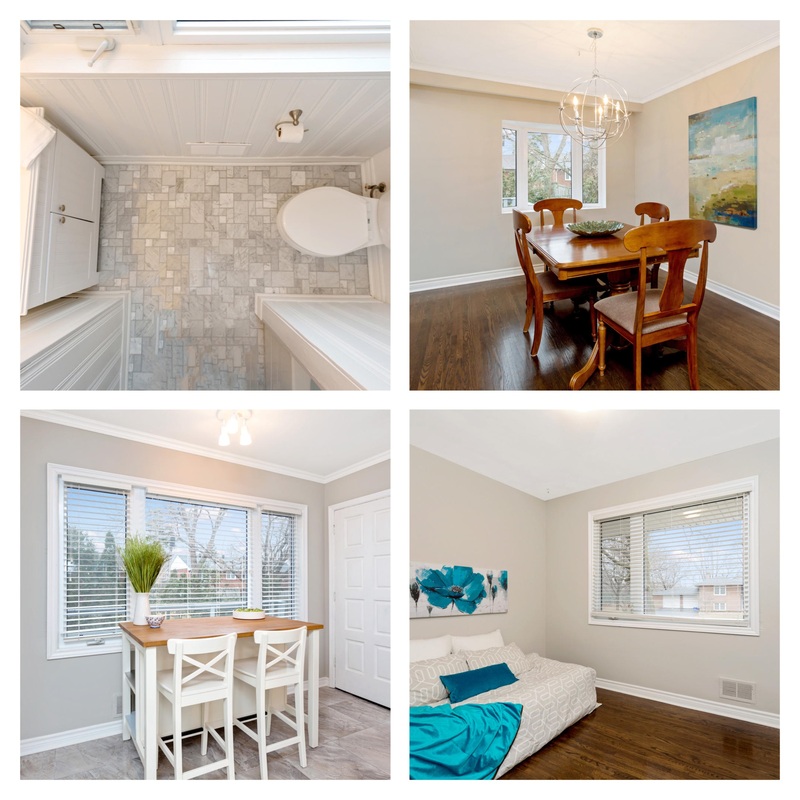 Again, it was critical to infuse colour into the accents to ensure the listing photos popped and that buyers were attracted enough to book a viewing,” said Stephanie. Stephanie sourced a contemporary chandelier that was a major upgrade from the original. Almost every home is lacking the proper amount of lighting to make the home feel as big and bright as it possibly can. In many dining rooms, they can feel boxy and plain, so we use a chandelier as a focal point to really draw the eye to something beautiful. We almost always recommend lighting upgrades because they always provide more than 100% return on investment. When everyone is eager and on board, the best things happen. You can see from the pictures that the house was on-point; we brought in all the accessories, bedding, art, etc. One of the best selling features of the home was that it was a wide lot home, so it was critical to take advantage of the amount of light the house received. Also, because it was a bungalow, furniture placement was critical to ensure the home felt spacious. If at all possible, try to avoid empty rooms as they make it harder for the buyer to judge the space properly. These two additional bedrooms were vacant, so we furnished them with beds, art and bed coverings from our staging inventory. This home is a great example of doing simple upgrades to make the home feel much more contemporary. Our clients understood that it wasn’t about present- ing the home in their own personal tastes, because they weren’t the likely demographic of people who would buy the home. Once we identified who would be the target buyer, we made sure all of our effort and choices for the home were geared towards meeting that buyer’s expectations and desires.